Woohoo! And since you are here and reading about Jetpack, I am pretty sure that you will give it a try, if you are not using it already. Jetpack is a WordPress plugin, oh sorry! It’s a plugin that has several plugins or we can say modules, inside it, which you can enable or disable with just a single click. At the time of writing, Jetpack has 37 components/modules that you can simply turn on/off with a click. These modules are very useful for almost every WordPress site, be it a small personal blog or some big-huge news website. 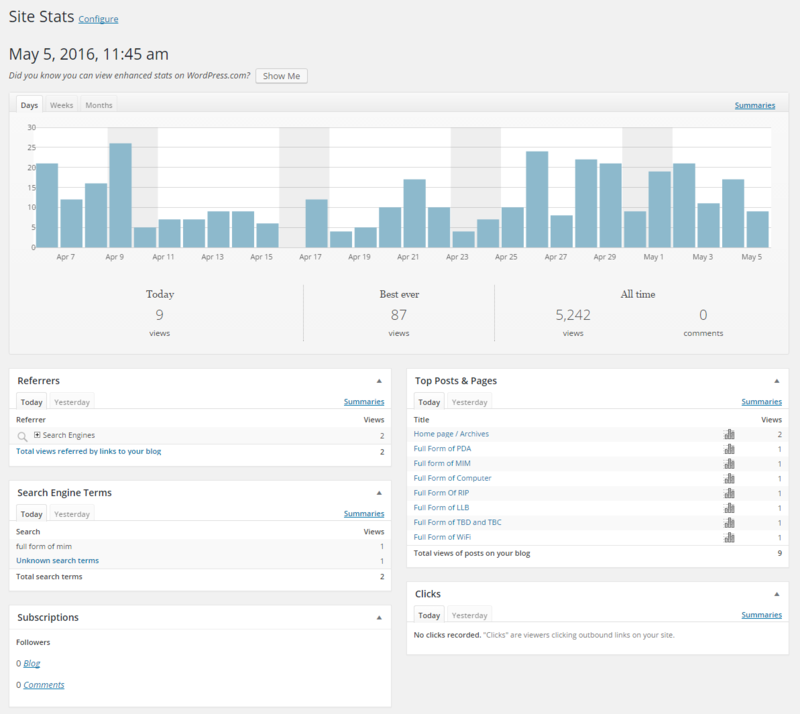 Some of the modules present in Jetpack that I find worth mentioning to attract attention to this state-of-the-art plugin are Site Stats(nicely segmented statistics for posts/pages with lots of metadata like referrer/search terms etc. and much more), Photon(a free CDN service), Monitor(for monitoring site uptime), Publicize(for automatically posting your posts to Social Networks), Related Posts, Spelling and Grammar check, Subscriptions , Data Backup for taking regular backups, and awesome comments system that lets your readers to sign in using any of their accounts from WordPress, facebook, Google-plus and twitter before commenting. These were a few biggies, but Jetpack also provides you lots of other smaller modules that you can use for tasks such as creating an image gallery to writing beautiful mathematical expressions. In this article, I will focus on modules and the features that make Jetpack an indispensable plugin for any WordPress based site. Yeah, Jetpack is really like any other WordPress plugin when it comes to installation and setting up. You can install it directly from Add New Plugin under Plugins Menu, or you can download it from wordpress.org and then manually upload it using FTP. Once installed and activated, Jetpack creates its own menu options in the admin sidebar. Now, the only step that is left is that you should link it with your WordPress.com and Akismet account(for spam protection), so that it can use them for its proper working. That’s it, now you are ready to play with the modules and then decide upon which ones you want to use according to your requirements. Jetpack automatically turns on a few of its modules upon activation, a few example of such modules that get automatically turned on are Spelling and Grammar Check, Site stats etc. but you can always turn them off, if you feel that you don’t require them however, that will be seldom the case. The module for site stats is turned on by default upon activation of Jetpack. Site stats provided by jetpack are really effective and all that you need for basic analysis of your site and your traffic. It provides important information regarding day-to-day views of your posts/pages/archives etc. and also information about Referrers, search engine terms that brought visitors to your site, clicks on your site, total subscriptions for blog and comments. It breaks down statistics in daily, monthly and yearly reports as you can see in the below snapshot. Also when you want to see no. of visitors from different countries, or total no. of views on posts from different authors you can simply click on “Show Me” button that takes you to WordPress.com to show you all enhanced site stats. You can always view more data by clicking on the summary link for each type of statistics. This module is one of the main modules that make Jetpack worth having for me. Don’t tell me that you never wanted a CDN service for your blog or site!! It not only makes your pages load faster but also reduces the bandwidth consumption on your servers, thus saving you dollars worth of money. Yes, Photon is free and you must be using it, unless you have already paid for some other CDN Service. It uses WordPress.com servers to serve images to your posts. Oh! BTW it is my second on the list of modules that make Jetpack worth having. As the name suggests! This module allows you to link your social accounts to WordPress and then posts automatically on them whenever you publish any new article, thus PUBLICITY. Also, before you publish a post you can select which social networks you want to publish on, and can also modify the description that goes to them, individually. It saves a lot of my time as I do not have to post to each social network page for my site, by myself. It is simple, it is quick, it is free. When you want to provide your readers with something extra, you can use Comments module from Jetpack, it allows your readers to use their social media logins for commenting on your site, while also providing them the option to use older method. 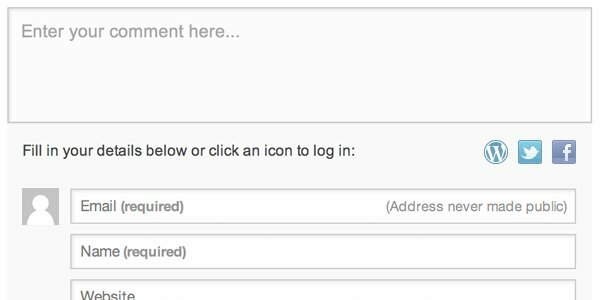 The reader can select from WordPress.com, Facebook, and twitter logins, and believe me for a reader in hurry, this is a real convenience. Do you know someone who wouldn’t like to have subscribers to their blog, because I haven’t met anyone with such wild thoughts. Everybody loves subscribers, it is good for your site traffic, for making a kind of bond with your regular readers, and a boon for your online marketing campaigns. And, Jetpack comes to rescue by providing a highly simple Blog and Comment based subscription system. 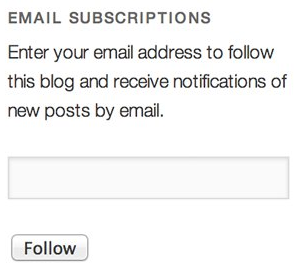 After a reader has subscribed to your blog, they receive all new posts directly into their mailbox. And this brings help in retaining your readers. Also, after you activate the Subscriptions Module, you get a subscription widget that you can use anywhere in your site, to start building your very own list of subscribers. Also, while commenting on your site Jetpack gives readers the option to subscribe to the comments and to the blog, thus really making an engaging conversation. Monitor from Jetpack is a great utility that allows to keep a check on the Site Downtime by continuously checking your site after every 5 minutes, and as soon as it detects that your site has went down, it sends you and email alerting you to the issue. Then it’s you who can take the job from their and bring your site online as quickly as possible and later investigate the issue further. It’s simple but very handy module, that could save hours of unnoticed downtime for your site. When it comes to showing relevant content to your visitors for higher engagement, Related Posts module from Jetpack really does the Job for you. The problem with the most of Related posts plugins(including Yet Another Related Posts Plugin) is that they have database intensive operations for searching, and indexing of contents but Jetpack excels there by using WordPress.com servers for this job thus, removes a great overhead from your site and delivers faster search results. When you turn on this module, you see Related Posts below the post content and sharing buttons. The Jetpack module for spelling and Grammar gets turned on automatically upon activating the plugin. Oh! and it’s very handy, as it can detect spelling mistakes and grammar corrections that you might have missed before hitting the publish button, and asks you if you want to correct them. Though most people argue that spelling corrections are offered by default in browser, they are right! but my browser never stops the article from publishing or shows me any of mistakes when I hit the publish button. At times, I have found really good grammatical mistakes on my part, so I feel that having a little extra check on spellings and grammar will only be beneficial because I wouldn’t want to lose my readers if they find these teeny-weeny mistakes and end up with the thought that my content is not trustable. Whoa! and it brings tiled galleries to further stylize your posts. This module allows you to create awesome image galleries using mosaic layout, that is modern in design and needs no extra effort or image editing. While adding image galleries to the article, one can just select the layout style or can continue with the default thumbnail layout. There are multiple options like rectangular, square and circular shape galleries. Moreover, to display the image in nice galleries jetpack does all image processing on WordPress.com servers thus, saving your website of any extra overheads and automatically serves images using WordPress.com CDN(even with photon turned off). A sweet addition, for turning your simple/advanced image galleries into great full screen experiences. If you happen to use more than one image inside your article, it automatically adds navigation buttons on either side, for navigating through all images. Now you can provide your readers with social sharing buttons, without need for another additional plugin. The services and their buttons that come with this jetpack module are Facebook, Twitter, Google Plus, LinkedIn, Reddit, Digg, Print and Email. And you also have options for selecting the appearance of buttons and showing share statistics. 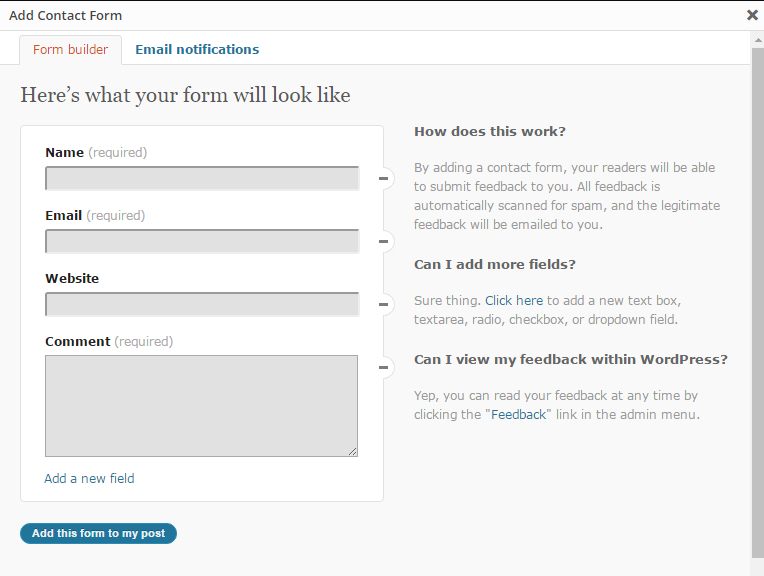 An easy to use contact form that you can embed into your posts or pages and start collecting user feedback. Below is the basic design of form, however you can also add or remove form fields according to your needs and requirements. The main thing that I like about it is that after mailing the information to you, it also saves the message/information on the WordPress itself under Feedback in Menu, which you can happily read after, because most of the times it happens that you might miss something on mail, or you just want to keep all of the feedbacks automatically saved somewhere for later use. However, if you can get quite technical and you need advanced forms then I will suggest you to look for plugins like Contact Form 7 and WP-Forms. This jetpack module gives you power of numerous short-codes that you can use for purposes like embedding youtube or vimeo videos into your posts, or many other kind of media’s like google maps, flickr, or twitter timelines. They are just too many. [archives], [bandcamp], [blip.tv], [cartodb], [codepen], [dailymotion], [facebook], [flickr], [gist],[googlemaps], [googleplus], [houzz], [instagram], [ jetpack_subscription_form ], [medium], [mixcloud], [polldaddy], [presentation], [recipes], [scribd], [slideshare],[slideshow], [soundcloud], [ted], [twitchtv], [twitter-timeline], [vimeo], [vine], [wufoo], [youtube], and [wpvideo (VideoPress)]. Latex- A powerful markup language for writing complex mathematical equations, formulas, etc. This module is very specific and is useful for the websites that have to display mathematical or scientific formulas. 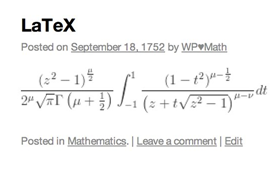 It lets you construct really great looking mathematical equations for your site. You can see one example of this in the below image. You can explore more as there are all sorts of options available. The Facebook Like Box Widget shows your Facebook Like Box within a sidebar on your theme. The Google+ Badge Widget allows you to display information about a person, a page, or a community from Google+. The Image Widget lets you easily add images to a sidebar on your theme. The Gravatar Widget allows you to pull in your Gravatar image along with some of your Gravatar profile data. 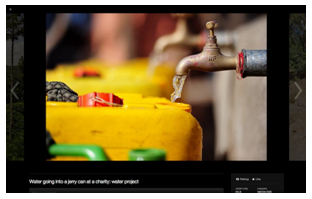 The Gallery Widget provides you with a simple way to display a photo gallery or slideshow in your blog’s sidebar. Requires the Tiled Gallery module. The Social Media Icons Widget lets you add icons for the most popular social networks to your sidebar or other widget area. The Contact Info Widget helps you display important information about your business. The widget allows you to show your business on a map, as well as your opening hours and contact information. The Goodreads Widget lets you display your Goodreads Shelf in your sidebar. Moreover, each of these widgets has a number of customization options. To use the widgets, go to Appearance → Widgets. Drag them into one of your sidebars and configure away. Protect is another module that is really useful if you are not already using some security plugin. It is a brute force attack prevention tool. Protect uses information from WordPress sites that have this plugin installed, to identify and block malicious IPs. It tracks failed login attempts across all Jetpack-connected sites using this Jetpack module. If any single IP has too many failed attempts in a short period of time, they are blocked from logging in to any site with this plugin installed. Protect is derived from BruteProtect, and will disable BruteProtect on your site if it is currently enabled. This module comes in handy when you want to verify the ownership of your site to the tools like like Google Webmasters, Bing and Pinterest. Verifying your site allows you to access advanced features on these other services. It’ll just add an invisible meta tag to the source code of your homepage. This module creates two XML sitemap files that list the URLs of posts and pages in your site with important information about each one. This files can be accessed by search engines like Google or Bing so they can crawl and understand your site. http://www.yoursitename.tld/news-sitemap.xml – a sitemap specially tailored for Google News. With this Jetpack module you can control which pages your widgets appear on. To control visibility, you just have to expand the widget and click the Visibility button next to the Save button, and then, choose a set of visibility options. This is a premium module with a monthly subscription. 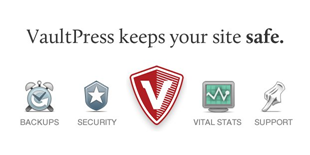 The VaultPress module will backup your site’s content, themes, and plugins in real-time, as well as perform regular security scans for common threats and attacks. View Plans & Pricing. There are many more small modules(Infinite Scroll, JSON API, Likes, Manage, Markdown, Mobile Theme, Notifications, Omnisearch, Post by Email, Single Sign On, VideoPress, WP.me Shortlinks, Custom CSS, Custom Content Types, Enhanced Distribution, Gravatar Hovercards) that come with Jetpack. They are quite useful, but are very focused to certain small tasks. You can find more about them by visiting JetPack.com or you can directly install the plugin and give them a try. Jetpack plugin comes with nice description for all of its modules. However, to speed up loading of your site, you can use PHOTON module of Jetpack but note that installing Jetpack and turning on all modules can have a high impact on loading times for your posts and pages. Thus, it is recommended that you use only those modules/plugins that are necessary for your site, you should disable others which are not being used. Previous articleThis is why women live longer than men?